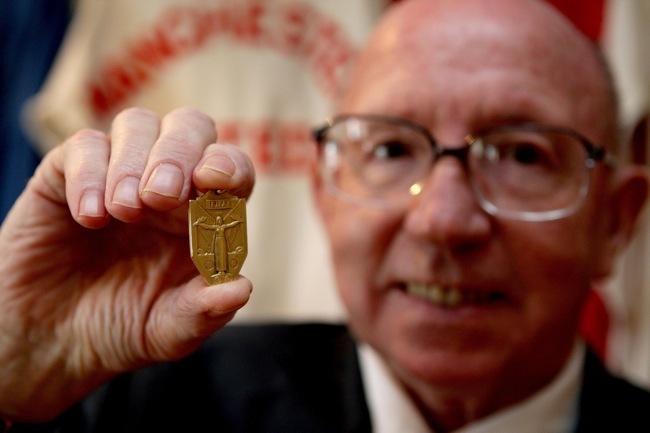 Manchester United paid £188,200 to buy Nobby Stiles’ 1966 World Cup winners’ medal at an auction of football memorabilia in Edinburgh. What’s that, a week’s wages for Wayne Rooney now? The price topped the £165,000 fetched by Alan Ball’s World Cup medal five years ago. Stiles, who played with distinction for United for more than a decade, made the grand sum of £424,438 by selling his prized football collection. Man Utd bought several of the 45 lots, which will be displayed in the club’s museum. “It was always my intention to leave the entire collection to my children,” Stiles, 68, admitted. “But I have three sons – how do you fairly divide up this sort of collection between them? What a shame Stiles had to do this. Even more of a shame when you consider how much a run-of-the-mill player like John O’Shea – who is not fit to lace Norbert’s boots – makes in a month. But at least the items will live on in United’s museum, rather than in a private collection on the other side of the world. Of all the places this could have ended up, the Manchester United museum is far from the worst. All in all, it was commendable that United bought it at all. At least there Stiles’ achievements will be publicly visible for man years to come. Also, I find the press’ coverage of John O’Shea’s improved contract a pathetic attack at a model professional. If Rooney can command 170k+, then why can’t O’Shea, a player who does his job, whatever it may be without ever muttering a word of complaint not deserve what he’s been given? O’Shea can play anywhere across the backline and centre mid. That sort of versatility is worth every penny. He has been one of United’s most loyal servants in modern years.